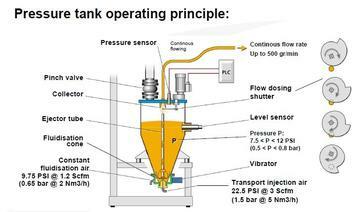 Dense phase is a powder pumping method reducing the amount of air required to transport the powder, VS standard Venturi method. There are different systems allowing to have a dense phase. 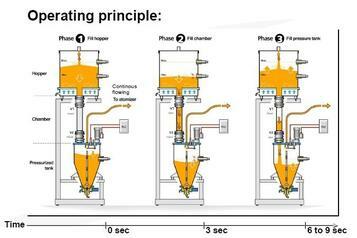 Basically the powder flow can be pushed mechanically which gives friction and then damages the powder. Our preferred choice is to push the powder flow with air compressed like in SAMES KREMLIN D3P or LDPS systems. 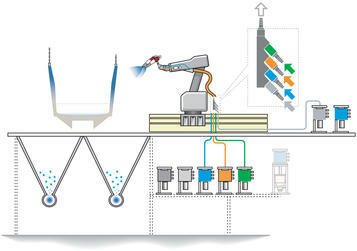 D3P or LDPS systems allow to supply robotic powder coating systems. It is the best use of dense phase technology, where you can get the benefit of a constant flow applied with a constant motion speed building consequently a contant thickness on the surface covered. LDPS (Long Distance Powder Supply) is an old and efficient technology used by SAMES to provide a constant flow on long distances while being gentle with the powder before applying it. Less air used and slow motion of powder.